Amelia shaves part of her head and preps for surgery. Tom explains his course of action and Amelia runs down everything she needs out of everyone in case she dies. The surgery is a success. It takes a long time for Amelia to wake up. When she does wake up, she can't speak. It takes her a while to speak, she refuses to take pain meds, and she regrets making Andrew promise to keep her moving after surgery. She finally starts speaking and she's only speaking French . Then she has temporary retrograde amnesia and forgets Derek is dead. Tom talks her down. When she worries that something is missing from her Andrew soothes her and reminds her of why she may feel that way. She breaks down and he comforts her. Owen tries to take her home. She tells him that he's free of her and that he can loce on because she doesn't know who she is any more. He wants to stay with her anyway and takes her home. 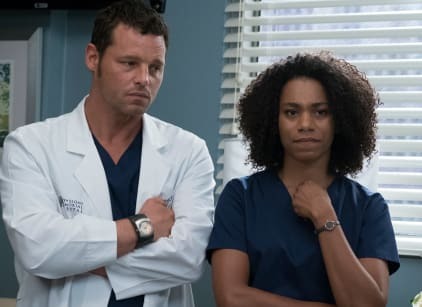 Meredith asks Jackson to take his name off the Megan study can be considers for the Harper Avery. Megan is upset that her recovery time is taking long. Riggs disappears and Meredith avoids his calls until finally she answer and realize he's trying to bring Farouk to America. It works and he reunites Megan with her son. Maggie goes to a dinner with Jackson, Catherine and Richard. Catherine talks about Jackson inheritance. Richard is jealous of Catherine's history with Tom. Jackson is reminded that Maggie is like his sister. Jo tells Ben about her ex. Ben tells her about working on something he's keeping from Bailey. April misses Harriet . Arizona comforts her. Later Arizona finds out Sofia wants to come home. Bailey and Richard interview interns.